Untreated high dislocation of the hip is a serious cause of physical and psychological disability. It causes premature osteoarthritis, pain, and restricted range of motion. Treatment of developmental dysplasia of the hip should be initiated up to the sixth to seventh week of life in order to provide a painless healthy development of the hip joint. Remodeling capacity of the hip joint may be limited, especially in patients with the treatment initiated after 4 years of age. For older children, treatment options are limited, and generally complex surgical procedures are required. 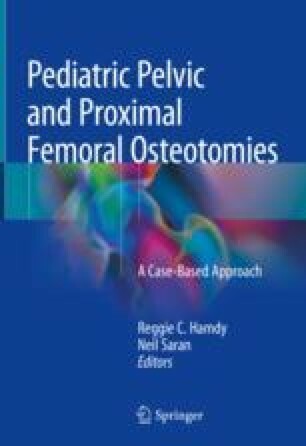 The Pembersal osteotomy is a well-defined surgical technique that provides a significant correction via single osteotomy. Furthermore, a secondary surgery for implant removal is not required because K-wire fixation for the graft is not routinely applied. After the Pembersal osteotomy, just like in the Salter osteotomy, the obturator foramen will be asymmetric on the anteroposterior pelvis. This tells us that there is an acetabular reorientation. In addition to the reorientation, there is a deepening of the acetabulum that takes place just like the Pemberton osteotomy. The differences between the Pembersal osteotomy and the Salter osteotomy are that in the Pembersal osteotomy, the internal table stays intact, the osteotomy is curved, and there is no need for a K-wire fixation. The difference between the Pembersal osteotomy and the Pemberton osteotomy is that in the Pembersal osteotomy, the osteotome cuts through and passes the triradiate cartilage.